Right when the #31DC2014 was about to begin, my bff was in Toronto with her sister.. so I sent her a text about a handful of days within the challenge that were, well, basically my kryptonite, and asked for her help. Not only did she give me ideas, but her sister put in some ideas as well.. so now I should be all set to get through the challenge. Did I mention that I love them? And if they happen to peruse this -- love you guys! Thank you! 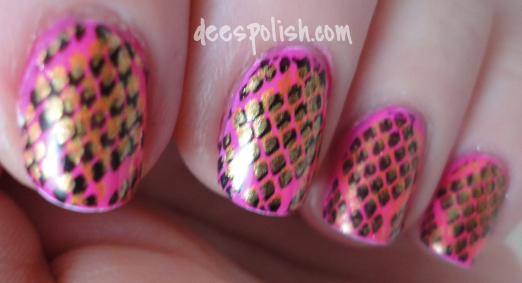 The idea for this day was to do nails inspired by Nicki Minaj's Anaconda.. perfect! 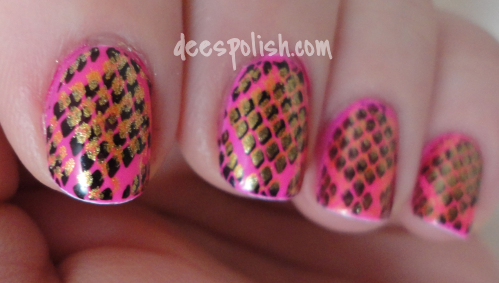 Snake skin nails, I can do that! I actually sat down to watch the video to get ideas for colours. Um, yeow! What a video! Anyways, I decided my palette would be hot pink, black, and gold. I started off with a base of FxFS White Matter to help make Orly Neon Heat pop! Then I stamped with FxFS Dark Matter and the BM-215 plate, and followed up with a stamp of Orly Glitz. These photos do not do these gems justice. I am obsessed with how they turned out! I will definitely sport these again when the challenge is all over! !